Personal experience with mental illness and navigating the mental health system makes family members and people with mental illness uniquely qualified to both educate elected officials on issues of importance and advocate for the policies and funding necessary to provide services that are essential to people with mental illness. Click here to find your local, state, and national legislators. NAMI PA, Main Line sends electronic Advocacy Alerts in support of legislation and policy to benefit individuals with mental illness and their families. If you would like to receive these Advocacy Alerts or participate in other advocacy, please contact Kristine Songster. Recent Advocacy Alerts are shown below and additional information about advocacy is available in the related files (see links at the bottom of this page). Today, Medicare Part D and Medicare Advantage plans must include “all or substantially all” of the medications in six protected classes, which include antidepressants and antipsychotics. A proposed new policy would allow plans to exclude certain drugs and would allow plans to impose prior authorization requirements even on patients who are on a stable medication regimen. A bipartisan letter is moving through the Senate asking the Centers for Medicare & Medicaid Services (CMS) to maintain the six protected classes policy in Medicare Part D.
Please contact Pennsylvania Senators Bob Casey and Pat Toomey TODAY and ask them to sign the letter to maintain the six protected classes of medication. Contact your U.S. Senators today! The Pennsylvania Senate could vote as early as today on a bill targeting individuals and families who rely on Medicaid. If it passes, people could lose coverage. House Bill 2138 calls for work requirements, lockout periods, eligibility determinations, and eligibility bans. Our partners at the Pennsylvania Health Access Network put together this graphic showing how HB 2138 could negatively impact you or your loved one. A Montgomery County Candidate Forum on Mental and Behavioral Health will be on Tuesday, October 23, from 7-8:30 p.m. at Good Shepherd Lutheran Church (132 E. Valley Forge Rd., King of Prussia, PA 19406). Come hear candidates talk about their policies for mental health and substance use disorders. This forum is co-sponsored by NAMI Montgomery County; NAMI PA, Main Line; Mental Health Partnerships; Hopeworx; Mont-Co CSP, and the Consumer Satisfaction Team of Montgomery County. As a mental health advocate, thank you for raising your voice to tell policymakers how their decisions impact people with mental illness and their families. But before people become policymakers, they are candidates running for office. #Vote4MentalHealth this November because the candidates you elect will make decisions that affect mental health services in your community. Thousands of local, state and federal elections will take place across the country. The decision on who to vote for is yours, but we are here to help you learn how to identify candidates who are mental health champions. Pledge to vote at our new #Vote4MentalHealth website, and we’ll share additional resources to help you #Vote4MentalHealth this fall. Haven’t voted before? Visit vote.gov to learn how to register in your state. Have you recently moved? Your voter registration is not automatically updated when you change your address. Learn how to update your voter registration in your state. Already registered? Check your registration. Sometimes polling locations and other voting details may change. Join us. Raise your voice, pledge to #Vote4MentalHealth this November and register to vote today. People with mental illness die an average of 10 years earlier than their peers—often of treatable health conditions. In order to treat an individual holistically and help them live longer, doctors need to know a person’s complete health information. Currently, an outdated federal regulation called 42 CFR Part 2 stops health care providers from having vital information about substance use, which is part of the picture they need to consider in treatment planning. Too often, this regulation leads to worse outcomes and avoidable tragedies. On Wednesday, the House is scheduled to vote on H.R. 6082, the Overdose Prevention and Patient Safety Act which would align 42 CFR Part 2 with the Health Insurance Portability and Accountability Act (HIPAA), the law that governs information-sharing for all other health conditions. This bill will keep strong patient protections in place while allowing for better treatment—and better outcomes—for the 8 million people with mental illness who also have substance use conditions. H.R. 6082 will help improve health care—and help people with mental illness live longer. Act now. Let your U.S. Representative know that you’re looking forward to their “Yes” vote on H.R. 6082. Next week, the House will consider multiple pieces of legislation to address the opioid epidemic, many of which will improve mental health and substance use care. Allow people using Medicare Part D to get prior authorization electronically from their health care providers for needed medications (PASS Act of 2018 – H.R. 5773). Congress is taking steps to treat health information fairly across all conditions. H.R. 5795, the Protect the Confidentiality of Substance Use Disorder Patient Records Act, will align an outdated federal regulation, 42 CFR Part 2, with the Health Insurance Portability and Accountability Act (HIPAA). This will allow for better integration and coordination of treatment—and better outcomes for people with mental health and substance use conditions. Act now. Ask your Representative to support these bills to address the opioid crisis and provide improved care for all people with mental health and substance use conditions. The GOP tax “reform” plan is moving through the legislature, and moving fast. It passed the House of Representatives last week, and the Senate is planning a vote by THIS FRIDAY– so we need to act NOW! This bill has a lot of moving parts, but the important thing to remember is that if this bill becomes law, big corporations will enjoy a huge tax cut at the expense of middle and low-income Americans. In order to pay for the enormous tax cuts to big corporations, the bill proposed to repeal the Affordable Care Act’s individual mandate (a requirement that people either buy health insurance or pay an annual penalty). There will be fewer healthy people in the marketplace to balance out the cost of health care for sick people. It will result in 4 million people losing health insurance by 2019 and 13 million by 2027. It will cause premiums to increase by about 10% every year, for the next ten years. This proposal will disproportionately target middle and low-income individuals, and will turn the tax plan into a healthcare repeal bill! We have shown time and time again that we will not stand for watered down healthcare, and we MUST let our Senators know that we will continue to fight! Use one or both of the methods below and contact your Senators today! Use the phone script below to give your Senators a call and tell them to VOTE NO on the tax bill! CLICK HERE to find your Senators’ phone numbers! CLICK HERE to send a pre-written email to your Senators asking them to VOTE NO on the Tax Cuts and Jobs Act! This is the easiest and fastest way to contact your Senators and make sure that everyone, including big corporations, pay their fair share of taxes! Throughout the year, we’ve asked Congress to stop health reform efforts that would hurt Americans with mental illness-and we’ve urged them to forge bipartisan solutions to stabilize the health insurance markets. The Alexander-Murray bill will strengthen and stabilize the health care system, reducing the risk of sharp premium increases and lack of insurance options. It maintains important cost-sharing reduction (CSR) subsidies and financial assistance, which help low- and middle-income people pay for out-of-pocket costs and insurance premiums. Contact your senators and tell them to support this bipartisan effort and protect mental health coverage for millions of Americans. Advocacy Alert: The Final Action on HB 59! HB 59 passed the PA State House in a 116 to 78 vote. It is now headed to Governor Wolf’s desk, who has spoken out against the legislation, and promised to veto it. This is great news! It is important for us to tell legislators when they are doing something we don’t like, and it is just as important for us to let them know when they are doing something good, and beneficial for the behavioral health community. Please see below, and either call or email Governor Wolf to let him know that you appreciate his veto on this bill, and to thank him for protecting Medicaid and the behavioral health community. Call Governor Wolf’s Harrisburg office at 717-787-2500, and use the phone script below to let him know that you support his decision to veto HB 59 and support the behavioral health community in Pennsylvania! Hello, my name is _____________. 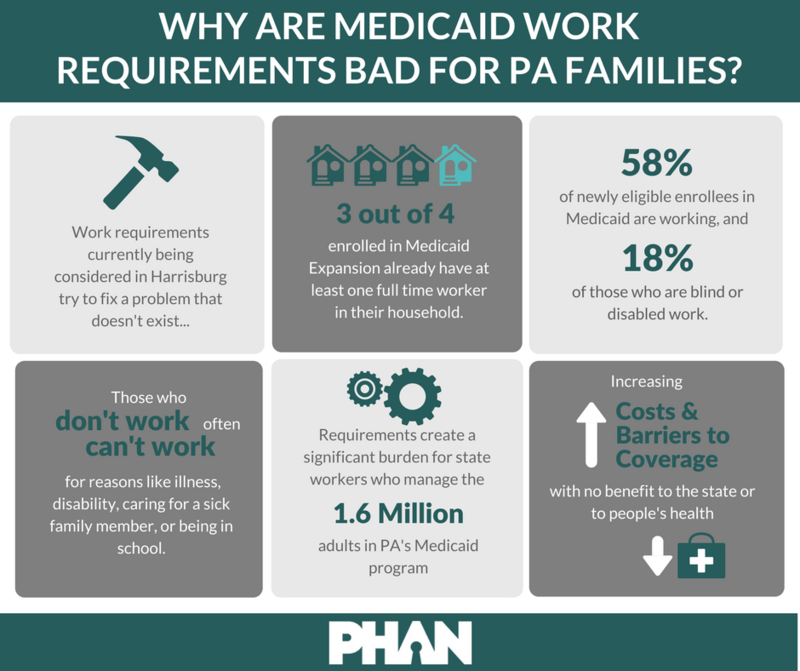 I want to thank Governor Wolf for speaking out against HB 59, which would impose work requirements on Medicaid beneficiaries, and make cuts in “non-essential” benefits. I appreciate the Governor’s support for the behavioral health community in Pennsylvania, and dedication to protecting Medicaid. Please let the Governor know that I support his decision to veto HB 59. Send a pre-written email to Governor Wolf to thank him for speaking out against HB 59, and protecting Medicaid! This bill would disproportionately harm people with mental illness who currently receive SSI benefits and have previous law enforcement interactions. Current law already requires suspension of SSI eligibility when a beneficiary is convicted of a felony or is incarcerated for a felony offense. would further suspend benefits for any allegation of a felony offense, or a probation or parole violation – regardless of how old it is. offers no exception for minor infractions in the past, or inactive cases that law enforcement agencies are no longer pursuing. The loss of eligibility for SSI would be especially devastating in states where it will result in people with mental illness also losing eligibility for Medicaid and access to treatment. This bill is attached to HR 2824, the Maternal, Infant and Early Childhood Home Visiting (MIECHV) Program. While NAMI does not oppose the MIECHV program, it should not be funded by cutting SSI benefits for people with serious mental illness. Tell your Representative TODAY to OPPOSE HR 2792. More than 32 million people would lose coverage nationwide. 1 million people in Pennsylvania would lose coverage. Pennsylvania would lose $6 billion by 2026 and $131 billion by 2036. The Graham-Cassidy Bill also places caps on Medicaid funding, which will force states to cut services and eligibility, harming children and adults with mental illness. Just a few months ago, you helped defeat health reform efforts that would have left millions without insurance and cut insurance protections. But Senators Bill Cassidy (R-LA) and Lindsey Graham (R-SC) just introduced a new bill that is even more dangerous for people with mental illness. While it is being promoted as offering more flexibility, their bill will make it harder for people to get psychiatric medications, case management, and mental health services-and other people with mental illness will lose their coverage entirely. The Senate just took the first step toward a vote this week on a health reform bill. To date, all the Senate health reform proposals hurt people with mental illness. You didn’t elect your Senators to dismantle mental health coverage for millions of Americans. No one with a mental health condition should ever be in danger of losing their mental health coverage. No one with a mental health condition should be forced to wait for basic care or not be able to get needed medications or treatment. No one with a mental health condition should end up on the streets or in the back of a police car because Congress voted to strip away mental health coverage. No matter how many times you have contacted your Senators before, reach out TODAY. Tell your Senators to vote NO on any health reform bill that fails people with mental illness. Tweet at your Senators, call (202) 224-3121 or email by clicking here. The PA General Assembly still has not passed a revenue plan as part of the 2017-2018 state budget! Take five minutes and let your legislators know that we need a fair, sustainable revenue plan, that does not harm Medicaid. Click Here to find your state senator and their contact information. Follow the script below, asking them to vote no on Medicaid proposals! Click Here for Governor Wolf’s contact information, and ask him to veto the bill if the Medicaid provisions are not removed! imposing work requirements on certain medical assistance recipients. charging a Medicaid premium for children with disabilities whose families receive income 1,000 percent above the federal poverty level. HB 59 now moves to the Senate. say NO to adding Medicaid premiums. say NO to adding work requirements. say NO to HB 59. PROTECT coverage so ALL children in Pennsylvania have access to the services they need. Senators are back from July 4th recess, where they heard from advocates like you about the harmful consequences of the Senate health reform bill (the Better Care Reconciliation Act). Thank you for speaking up, but the fight is not over. The future of mental health coverage is being decided right now. Currently, 1 in 5 Americans live with a mental illness, but only half get needed treatment. This bill will make it even harder for people to get psychiatric medications, case management and mental health services. If this bill passes, millions of Americans will lose coverage for mental health care. Tell your Senators to #Act4MentalHealth to ensure that we have more coverage for mental health care, not less. Email Now! State lawmakers target Medical Assistance loophole to close budget deficit. In an attempt to fund the state budget, Pennsylvania state legislators are considering adding premiums on coverage for children with disabilities who are receivinng Medical Assistance (Medicaid). This applies to families who receive Medical Assistance through Category PH-95 (loophole). Most families already pay a premium for their private insurance, but their child with a disability needs Medical Assistance to supplement costs and services not covered by their primary coverage. leave Medical Assistance through PH-95 alone. not add premiums on coverage for children with disabilities, as included in HB 1354, p28, line 16. Every great movement is fueled by powerful voices. Join NAMI’s Virtual Hill Day and more than 1,000 NAMI advocates who will be meeting in-person on Capitol Hill to ask Senators to #Act4MentalHealth today. Make a call. Send an email. Tweet. Tell your Senators to oppose any health reform bill that leaves fewer people with coverage for mental health care. Go to http://bit.ly/2sjvp2q for tips on three ways to contact your Senators, including a sample script. Or you can call Sen. Toomey (202-224-4254) or email him. The Senate health reform bill, the Better Care Reconciliation Act of 2017 (BCRA), will take us backwards. The BCRA will allow states to let health insurance plans drop mental health and substance use coverage. It is outrageous to even suggest that mental health coverage is optional. The Senate bill will also devastate community mental health programs by cutting Medicaid funding, making it harder for people to get psychiatric medications, case management and mental health services. It will result in less mental health care and shift people with mental illnesses into already-strained emergency rooms, hospitals and jails. Help keep the promise of better mental health care alive. Tell your Senators: Vote NO on the BCRA. The Senate Better Care Reconciliation Act was released yesterday. This bill includes provisions that would have devastating effects on access to care for individuals with mental illness. It would phase out the expansion of Medicaid, substantially reduce the funding for Medicaid in future years, allow states to require Medicaid recipients to work, and allow states to opt out of requiring insurers to include coverage of mental health treatment (http://www.businessinsider.com/senate-healthcare-bill-trumpcare-ahca-details-2017-6). Please call Sen. Toomey (202-224-4254) or email him (https://www.toomey.senate.gov/?p=contact). In April, the Pennsylvania House of Representatives passed House Bill 218. $9 million in cuts to mental health and substance use disorder funding means more Pennsylvanians would be institutionalized instead of served in the community. Reduction of $5 million in community mental health county allocations. Reduction of $4 million to county behavioral health funding. $4.8 million in cuts to counties. $6 million in cuts to home and community-based services. PA House Bill 218 will have a devastating impact on vulnerable Pennsylvanians if passed as is. Call or email your legislator NOW. 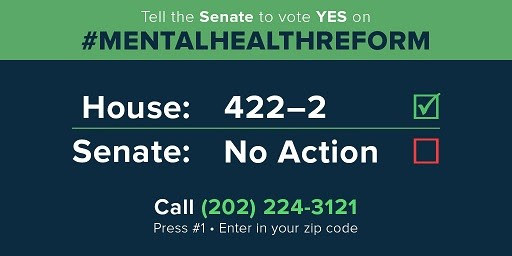 Tell your state senator cuts to mental health and human services are NOT acceptable. Call Today to Support Mental Health! The American Health Care Act passed by the House would have devastating consequences for access to needed mental health care. The Senate has set up a working group of 13 Senators to draft the Senate’s own version of health care reform. Senator Toomey chairs the Subcommittee on Health for the Senate Finance Committee and Senator Casey serves on the Senate Health Labor Education and Pensions Committee. This means that it’s especially important for Pennsylvanians to speak up. Get in touch with our senators this week to try to shape the Senate bill, which is probably going to be voted on by the full Senate by the end of June. Please call: Senator Toomey – (215) 241-1090 or (202) 224-4254 Senator Casey – (215) 405-9660 or (202) 224-6324. · Preserve Medicaid without any per capita cap; Medicaid is an efficient program that delivers important services for individuals with mental illness. · Preserve Medicaid expansion which has substantially improved coverage for single adults with mental illness. · Preserve the current protections for people with pre-existing conditions. · Preserve the requirement to include coverage of mental health and substance use; do not let states opt out of this requirement. 24 million will lose mental health coverage…..
Coverage for mental health care helps people get treatment when they need it-helping them to stay in school, on the job and in recovery. But the American Health Care Act (AHCA), Congress’ bill to repeal and replace the Affordable Care Act, would reduce funding for health coverage-from insurance plans to Medicaid-and put mental health care at risk. Under the AHCA, 14 million fewer people would be covered by Medicaid. In the middle of an opioid crisis and the highest suicide rate in 30 years, Congress shouldn’t desert its commitment to coverage for mental health and substance use treatment. Tell Congress that 24 million Americans losing mental health coverage is wrong. Tell Congress to Keep What Works! Cross-posted from NAMI National on February 20, 2017. Congress is on break, so now is the time to tell Senators and Representatives about the importance of quality, affordable mental health coverage. 1 in 5 Americans experience a mental health condition and coverage for mental health care is critical to early identification, treatment and recovery. Go to a town hall meeting, call 202-224-3121 or email your members of Congress to stand up for mental health coverage and insurance safeguards. I am a person living with a mental health condition or I am a family member of someone living with a mental health condition or I am a professional in the mental health field. The Affordable Care Act and Medicaid provide life-saving mental health coverage so Americans get treatment when they need it. Do NOT repeal the ACA without a replacement that maintains or improves mental health coverage and insurance protections. Do NOT allow cuts or caps to Medicaid funding that leave states and communities paying more. If you can’t make it to a town hall meeting or have time for a call, make your voice heard by emailing right now. Cross-posted from Mental Health Association of Southeastern Pennsylvania’s Take5 program on February 13, 2017. Today is the day! (Or tomorrow if you can’t make it today.) Join us and our partners at Resources for Human Development today for a statewide Call-In Day to support the more than 1.1 million people in Pennsylvania who have gained healthcare coverage through the Affordable Care Act. Your advocacy is making a difference. Already, we are seeing signs that legislators are acknowledging that repairing issues in the Affordable Care Act have more support from their constituents than repealing coverage. This shift means that your persistent advocacy is paying off! Your story is needed to shape healthcare in America! We are hearing that legislators are increasingly feeling pressure to have a comprehensive plan in place to provide health coverage before repeal of the ACA. We are also hearing that they are considering significant cuts to the Medicaid program. Our legislators need to understand the impact that a cutting from these health programs would have on your lives, especially if you benefit from Medicaid, from subsidies on the insurance marketplace, or from the fact that mental health and substance use treatment are now required benefits in most individual and small group plans. Your story will make a difference! You can find contact numbers for your Senators here. You can find contact numbers for your Representatives here. Please join us in this important effort to make sure that people can access healthcare in PA! Can’t make the call today? There’s also a call in day tomorrow convened by MHASP’s partners at Pennsylvania Health Access Network! Want to be involved in our statewide Healthcare and Mental Health coalition? Contact dcampanella@mhasp.org for more information. If you prefer not to call your legislators, you can also email them. Cross-posted from NAMI National on February 1, 2017. In Congressional hearings this week, members of Congress will discuss the pros and cons of Medicaid and the health insurance marketplaces. Nearly 1 out of 3 people covered by Medicaid expansion live with a mental health or substance use condition. And people with marketplace insurance plans have fair and equal mental health coverage. With this coverage, people have access to mental health services that support recovery. Let your members of Congress know how Medicaid or insurance marketplace plans are helping you or somebody you know. Cross-posted from NAMI National. NAMI is nonpartisan. We support policies that help people with mental health conditions and their families. Congress is debating the future of mental health care right now. If there’s one thing we know, they need to hear from you. Stand up with thousands of others. Tell your members of Congress that you want your mental health care protected. Debate is raging over the future of health care-insert your voice into the conversation to protect mental health. Ask them to protect Medicaid and insurance safeguards that help millions of Americans who get mental health care. Act Today to Protect Health Care! The Senate is planning to pass a budget that will begin the process of repealing the Patient Protection and Affordable Care Act (ACA or ObamaCare) as soon as TOMORROW. This would make it possible for Congress to take health coverage away from millions of people before having a plan to replace it. While Congress has passed many bills to repeal the ACA in the past, it was clear that President Obama would veto them. But this is not the case with President-elect Donald Trump, who says he will sign an ACA repeal bill. Call the US Capitol Switchboard at (202) 224-3121 and ask to be connected to your Senator’s office. Vote NO on the Budget package that leads to eliminating the Affordable Care Act. People with mental illnesses need access to comprehensive and affordable health care. We need the Medicaid expansion and mental health parity. For more information, please see the more complete message below. Congressional leaders have declared that one of their first goals in the new Congress is to repeal the Patient Protection and Affordable Care Act (ACA or Obamacare) and “replace” it. While Congress has passed many bills to repeal the ACA in the past, it was clear that President Obama would veto them. But this is not the case with President-elect Donald Trump, who says he will sign an ACA repeal bill. The Senate is planning to pass a budget that will begin the process of repealing the ACA as soon as TOMORROW. This would make it possible for Congress to take health coverage away from millions of people before having a plan to replace it. We must educate Members of Congress now about why the ACA is so important to everyone, and especially to people with mental illnesses. Because of the ACA, millions of Americans with mental illnesses or substance use disorders have access to health insurance thanks to the Medicaid Expansion. This coverage has saved lives. Because of the ACA, Mental Health Parity was expanded and now provides protections to millions of more Americans. Because of the ACA, health insurers can’t deny you health insurance based on a mental illness. There are countless other provisions in the ACA that are important to people with mental illnesses. The ACA has unquestionably improved access to care for people with mental illnesses and chronic conditions to help them live healthy, independent, and fulfilling lives. Learn more here . The Mental Health Reform legislation we have all worked hard on has been added to a bill-the 21st Century Cures Act-that Congress will vote on as early as this week. Adding to our excitement, language supporting CIT, mental health courts and other provisions to reduce the involvement of people with mental illness in the criminal justice system have also been added. Thank you for all you do to help build better lives for all affected by mental illness. Mental illness is still being denied by insurers at more than 2 times the rate of physical illness. People aren’t getting the mental health care they need when they need it. Mental Health Reform, S. 2680, will help. But, time is running out. Take 2 minutes today, Tuesday, November 15th. Tell them to demand a vote on S. 2680 now. The moment has come to reframe mental health as a basic right that must be realized in the context of human dignity. The Destination Dignity March, a collective effort of thousands affected by mental health conditions, is a crucial step in this direction for a healthier America. Members of the Mental Health Association of Southeastern Pennsylvania, through its ICAN program, will be taking part in the Destination Dignity: March for Dignity and Change in Mental Health in Washington D.C. on October 10, 2016. Advocates from around the country will be traveling to rally and march to the Capitol to express their support for Recovery values and principles. You can still take part, even if you’re unable to attend in person. Destination Dignity is hosting a digital rally to coincide with the March. Go on Twitter, and Facebook, and the Internet to express your support for the estimated 1 in 4 Americans living with mental health conditions. We need our policymakers in Washington to understand that their decisions have a real impact on the lives of people with mental health conditions, their family members and friends, and those that work side-by-side with people in recovery. Make sure that you’re registered to vote in the 2016 election. There are approximately 4 Weeks until Election Day, and the last day to register to vote is October 11, 2016. You can register to vote online and change your existing registration in Pennsylvania here . Not sure if you’re registered to vote (or where?) You can check that here. Not sure where your polling place is?You can check that here. Want to submit an absentee ballot? The application is here. Please note that if you are submitting an absentee ballot, it must be mailed no later than Wednesday, October 26th to insure that it gets processed in time. People with mental health conditions, their family members, and allies: Take part in the process. Mental health advocacy is not about political parties. Right or left. It’s about getting good care for the 60 million Americans who live with mental health conditions. Take 2 minutes on Friday, September 2nd.